Ghosn says it will be very difficult for car manufacturers to face tough times in Europe without alliances. BEIJING – Renault rode to the rescue of Nissan Motor when the Japanese company was on the brink of collapse in 1999. Now Carlos Ghosn – who heads of both automakers as CEO of their 13-year alliance – says it is Nissan's turn to return the favor. Nissan's healthy earnings have been "indispensible" in helping Renault weather the European financial crisis and the slump in the local car market that saw sales hit a 14-year low in March. 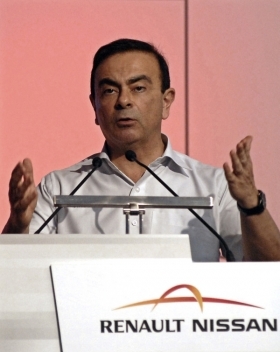 "I don't think, without the alliance, Renault would be able to face the very severe situation that car manufacturers in Europe are facing today," Ghosn said Monday at the Beijing auto show. "And Europe is not finished; 2012 is tough. But wait, it's not finished ... 2013, '14, '15 are going to be tough also," he said. In February, Renault reported a 39 percent drop in net income to 2.14 billion euros ($2.82 billion). But the decline was mitigated by a 3 percent increase in net income at Nissan. Renault owns a 43.4 percent stake in Nissan, which holds a 15 percent stake in its French partner. European new-car sales dropped to a 14-year monthly low in March, with Renault, Fiat and PSA/Peugeot-Citroen among the hardest hit as economic growth stalled because of the region's sovereign-debt crisis and falling consumer confidence. Registrations in the 27-member EU states plus Switzerland, Norway and Iceland fell 6.6 percent from a year earlier to 1.5 million vehicles, the lowest figure for March since 1998. Only Volkswagen gained, helped by a buoyant German market. Said Ghosn: "It's going to be very difficult for car manufacturers to face this kind of prospect without alliances and without support." Just as a healthy Renault helped Nissan in 1999 with support for r&d in new products and technology, he said, Nissan aids its partner now by giving a wider global manufacturing footprint, additional research resources and greater purchasing power.